In western Shan State, you will find picturesque Inle Lake, famous for its floating villages and gardens and the unique way of life of the local Intha people, with their living communities based entirely on the water. For practical information including restaurants, ATMs, accommodation and transport, visit our Nyaung Shwe page. The lake, which measures 22 km long by 10 km wide, and sits in a valley between two mountain ranges, feels like a different world to the rest of Myanmar: in villages and towns across the lake, wooden houses are built on stilts and fishermen steer their one-man boats with a characteristic rowing style, wrapping one leg around their oar. Along with fishing, traditional handicrafts are an important part of the local economy, and you will get to see silk weavers and silversmiths plying their trade on the lake. And as with all of Myanmar, religion plays a massive part in local life, and numerous pagodas and monasteries can be found on the lake and its shores. There also are many restaurants dotted around, where you can indulge in their delicious catches of the day. 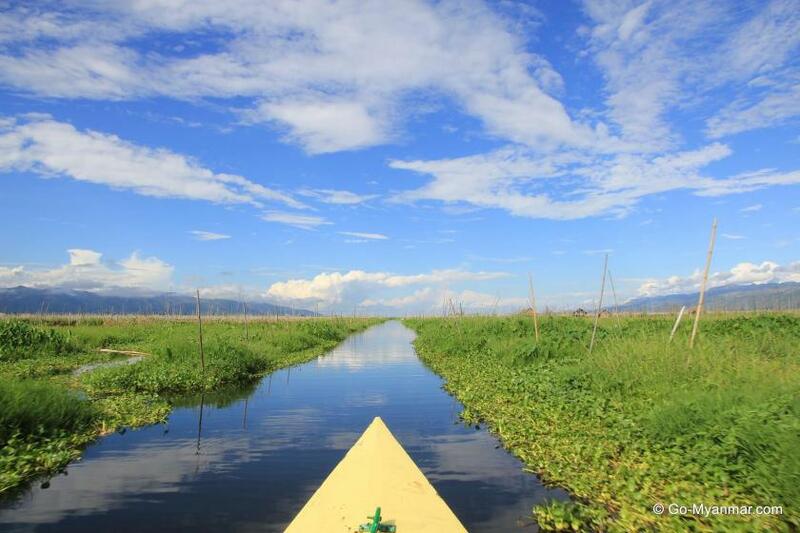 Inle is one of Myanmar’s most popular destinations for travellers, so when you travel around the lake, part of what you see will inevitably be geared towards tourists. You may be taken to one too many handicraft workshops, as most guides get commission on sales, and negative examples of tourism development can be seen in everything from environmental degradation to the Kayan women found selling items in some village shops, wearing the traditional rings which elongate their necks; taking photos of them is encouraged, but the tribe is not in fact indigenous to this area - their own home is in the hills south west of Loikaw. However, in many places the authentic life on the lake shines through, and it is so large – and the sites sufficiently spread out – that, outside of the villages and markets, it is always possible to find quiet, untouristy corners. Furthermore, steps are being taken to protect the area from man-made damage, including UNESCO designating Inle as a biosphere reserve. Take a look at our YouTube video of Inle Lake from near Maing Thauk village and for a wider selection of photos of the area, see our Flickr photo set. Most boat trips around Inle Lake start at the town of Nyaung Shwe, a few kilometers to its north (where most budget and mid-range accommodation is found), although some people may base themselves at the hotels dotted around the lake’s shores (mostly luxury). 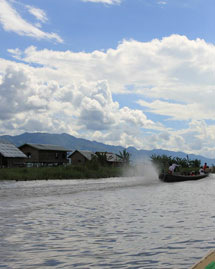 There is a K12,500 entry fee for the Inle Lake area, which you pay when entering Nyaung Shwe. The boarding area is located around the bridge at the western end of Yone Gyi Road in Nyaung Shwe, where local fishermen and guides compete for mooring space. From here, you will want to set off early in the morning for your trip around the lake. There is a lot to see on Inle Lake and in the villages that surround it, so, unless you stay in the area for three days or more, you will need to be selective about what you want to see and do. Boat drivers, who also act as tour guides, will advise you on many of the best sights on the lake and its shores, but highlights can be found listed below. You can hire a bicycle for around K1500 per day in Nyaung Shwe, allowing you to explore the beautiful scenery on the eastern side of the lake, including Maing Thauk and the Red Mountain Estate vineyard. Check with your guide if you want to have a swim in the lake, because the water can be very shallow (in most parts around 1.5 to 3 metres) and pollution may be an issue at certain times of year. Remember to pack your sunscreen before a day on the lake, because between stops there is no shade out there. 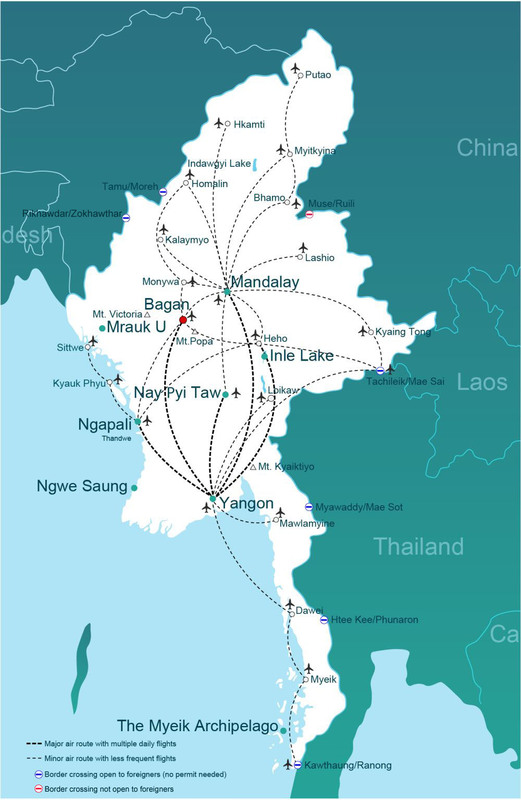 Tours of Inle Lake and the surrounding area can be booked through this website and it is also possible to take a spectacular hot air balloon trip over the water (ballooning season is mid-November to the end of March, US$325 per person); to find out more or make a booking fill out this form or email [email protected]. 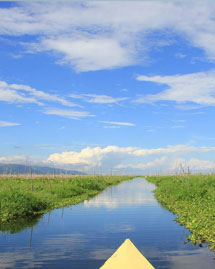 We also offer a variety of Myanmar country tours that include Inle Lake - find out more here. 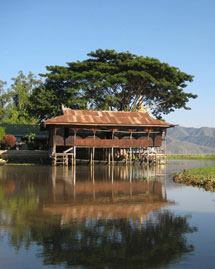 Ywama is a typical example of a traditional Inle Lake settlement, and is most famous for its floating market. 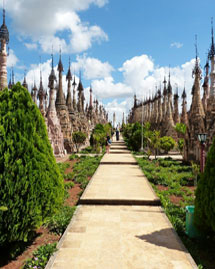 It also has various handicraft workshops, a monastery and the Phaung Daw Oo Pagoda, one of the holiest sites in Shan State, visited by Buddhist worshippers from all around Myanmar. The shrine itself is huge and features five ancient golden Buddhas, and next to it can be found a large golden barge, a replica of the one said to have been used by King Alaung Sithu to travel around the country. The Phaung Daw Oo Pagoda festival takes place in October and features the passage of four revered Buddha images around the villages of Inle Lake on the barge, taking 18 days to complete their journey. There are also rowing competitions between the villages, using the renowned local leg rowing style. For exact dates and full Myanmar festival listings, go to our festivals calendar. Beautiful as it is, Ywama village has become a focal point of tourism on Inle Lake, and can sometimes get crowded – if you want to avoid the crowds, get there early in the morning. There are a number of excellent restaurants to be found on the canal to Ywama village, serving local Shan food, as well as other Chinese and Myanmar dishes; just across the water from the pagoda is Mr Toe's restaurant, which serves a range of freshly-caught fish dishes and also offers tradional Shan cooking classes in a village house near the restaurant (classes must be pre-booked, email [email protected] to find out more). Take a look at our YouTube video of the Phaung Daw Oo Pagoda and Ywama village. The village of Nampan is another an excellent example of a traditional floating village, with its wooden houses all built on stilts. In the village you will find hand-made cheroot (traditional local cigar) factories and the oldest pagoda on the lake, the Alodaw Pauk Pagoda, a large gem-encrusted golden shrine. There are also several good, affordable restaurants here. Just to the north of the village, you will find floating gardens where the Intha people grow a variety of vegetables and flowers, both for their own consumption and to export around the country. This method of agriculture is another unique aspect of life on the lake, as the villagers harness nature to develop these gardens over many generations. Located on the eastern shore of Inle Lake, half of Maing Thauk village is on the lake and half is on land, with the two parts linked by a long wooden bridge. Here you will find a bustling market and, further up the side of the mountain, the Maing Thauk Forest Monastery, from where you can see lovely views over lake. Maing Thauk can be reached either as part of a boat tour, or by car or bicycle from Nyaung Shwe. The village of Indein (also spelt Inn Thein, and meaning ‘shallow lake’) is most famous for its crumbling and atmospheric groups of ancient pagodas, some of which are now being restored (sometimes in rather too pristine fashion). 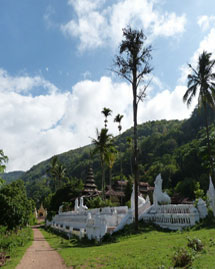 These include Nyaung Oak, immediately behind the village, with its carvings of mythical creatures, and Shwe Inn Thein Paya, which can be found at the top of a long and atmospheric covered walkway leading up the hill; the pagoda area features many hundreds of densely packed stupas to be explored. From Shwe Inthein Paya you can also see some wonderful views across the lake. Indein village also has a vibrant market near the jetty. The village and pagodas can be reached by boat via a enjoyable twisting canal from Ywama, although this is usually not accessible during the dry season, as the water is too shallow. Note that Indein is some distance from the main circuit of Inle Lake, so a trip here will make your boat tour slightly longer and more expensive. Nga Hpe Kyaung monastery, Inthar Heritage House and cats! Nga Hpe Kyaung monastery, located on the lake, is constructed from wood and features a beautiful meditation hall. It was previously famous for its jumping cats; the local monks trained them to jump through hoops. This practice has now stopped, however – due to the cats becoming arthritic and/or because they thought it was an unfair practice. The monks were always honest enough to say it was only done for the tourists! But cat lovers are well catered for on Inle Lake; the Inle Heritage House, a beautiful structure located in the middle of the lake and built from reclaimed wood, is a restaurant, art gallery and cat sanctuary. The Burmese Cat preservation project has carried out a breeding program to reintroduce these elegant felines to Myanmar. 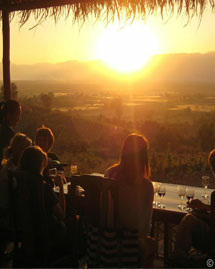 For an entirely different type of experience, head up to the Red Mountain Estate vineyard in the hills to the east of Inle Lake for some wine tasting. One of only two vineyards in Myanmar, this definitely breaks the mould of your day-to-day Myanmar experience, making it suddenly feel as if you have been transplanted to the south of France. You can try the inexpensive tasting menu (featuring wines from four different types of grape) whilst taking in the stunning sunset views over the lake. The vineyard can be reached by taxi or bicycle from Nyaung Shwe or the hotels on the east side of the lake.